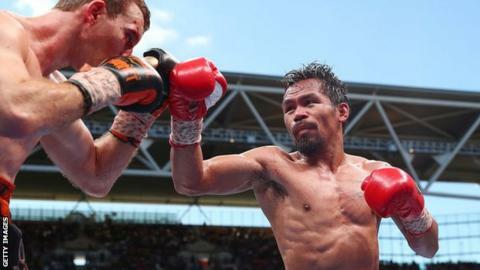 Former champion Manny Pacquiao has pulled out of a welterweight rematch with Australian Jeff Horn, who stunned the boxing world with victory in July. The Filipino fighter, 38, is said to have "other commitments" at the time of the rescheduled bout on 12 November. Horn, a 29-year-old former schoolteacher, was given a unanimous 12-round decision in Brisbane. The World Boxing Organization reviewed the result with a new set of judges, who still favoured Horn for the win. The Queensland state government, who are financial backers for the fight, say they will continue to support Horn's WBO world welterweight title defence, whoever the challenger is. Pacquiao, now senator of the Philippines, announced he planned to quit boxing last year to pursue his political ambitions. His coach, Freddie Roach, advised him to call time on his career after the defeat to Horn, but Pacqiuao wanted the rematch.